Presenting an ornate Queen's Crown ornament with a cross on the top that is fit for the queen in your life. This royalty ornament contains large crystals throughout the crown's base and points making this ornament one that cannot be ignored! 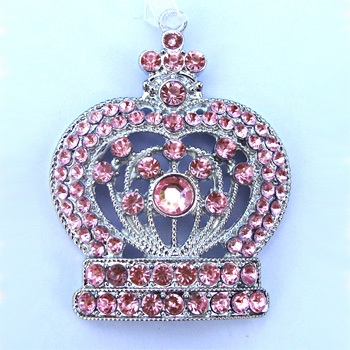 Queen Crown Christmas tree ornaments which depicts a crown of a queen made out heavy metal and adorned with various sized pink crystal stones can be purchased at Designer Ornaments.